A frightening amount of time has passed since we last reported on this title. Just where has the time gone and what's been happening?! Work on printing the watercolours has had its ups and downs. I'm printing them on an Epson PRO 3800 which takes an A2 sheet. The quality of the printed image is stunning on the 330gsm Somerset. But I soon found problems with printing on such a thick sheet. Epson didn't want to know as I hadn't bought the paper from them - thanks, guys. Only after much experimentation and assistance from fellow-sufferers out there on the internet who had similar problems did I find out how to get perfect results. Slowly the pile of 1,600 blank sheets became a pile of printed sheets. It was essential that the watercolours were laid down first, before the letterpress went on, but by that time it was winter, and one of the coldest winters we have had for some time. During the winter of 2008/9 I blew our gas bill sky-high by heating the garage where the press lives so that I could get Palladio's Homes finished, but this winter getting not just the air but also the press to a sensible working temperature was beyond hope. Hiatus number one. It seemed a good moment to give the Western proof press a much needed overhaul and in March the engineer spent a day getting it back into shape. To ensure a really good outcome I had sent the two inking rollers off for recovering, an expensive business but they are so important to a good impression that I reckoned now was the time to have them overhauled too. Unfortunately when the engineer and I came to try them out one was clearly misshapen and had to go back. Hiatus number two. And then teh press stopped inking up properly. I have spent about a week and another visit from the engineer failing to see why a piece of machinery with about as many moving parts as a folding chair should fail. Hiatus number three. Finally we are back on track and serious letterpress has started. I am hand-setting the main text in Stephenson Blake 14pt Caslon Old Face and having to dis and set for each pair of pages. I shall be building my customary photo-diary for the title as work proceeds. More on that anon. As you will see below we have a record number of appearances at various shows this year and we really want to see Winter Light on the stand at them. Below you can see one of the four-page openings - each page is A3 - with four of Hugh Buchanan's watercolours. 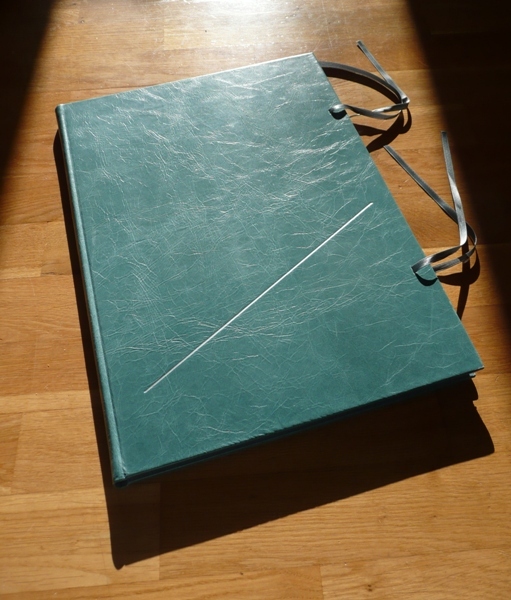 We had a great response to the trial binding that we took to the Oxford Fine Press Book Fair. There will be 100 copies for sale with a further 25 not for sale. We are offering a pre-publication price of £220 (€270, US$370) for those who would like to be sure of a copy and are happy to pay now in return for a generous discount. The price on publication will be £275 (€330, US$450). Subscribers to the Press will receive their usual 15% discount on either price. (Shipping is charged extra at cost as usual. Euro and dollar prices might change with exchange rate fluctuations.) If you would like a copy at the pre-publication price please contact us and we can quote you the price including shipping. I hope to send out a small brochure shortly. at which we shall be exhibiting - a record number this year!! For just the second time The International Antiquarian Book Fair is hosting a 'Downstairs' section of fine presses and others who will be displaying their product and taking orders. We'll be there! For details visit here and look for the 'events & exhibitors downstairs' button. The following week we shall be taking a stand at the Contemporary Craft Fair in Bovey Tracey. This is a top-notch craft fair with about 100 stands. It runs from the Thursday to the Sunday and includes demonstrations, food and drink, lectures, and more. For details visit here. The Oxford Guild of Printers is a group of printing aficionados who once again are holding their wayzgoose, this year in Burford School Hall, near Oxford. Presses and printers and binders and others will have books, type, paper, and heaven knows what on sale. Plug OX18 4PL into your satnav and get along. All welcome, free entry. For details visit here. A first for the Old School Press this year is an appearance at the Art in Action event held near Wheatley, Oxfordshire. As well as the 200 artists and craftspeople demonstrating their skills, there is also a 'Market' where we shall be exhibiting. This is always a great day out. For details visit here. We then have something of a rest (time to do some printing?) before the now-biennial Oak Knoll Book Fest in New Castle, Delaware. We have missed the last couple of Fests so are looking forward to renewing acquaintances and downing a Yingling or two again at the Arsenal. Bob Fleck has asked me to be one of the speakers, something I'm looking forward to doing. For details visit here. As the finale to an exhausting round of shows, we shall be at Made by Hand in South Wales. 135 of the UK's finest makers in the splendid setting of Tredegar House on the outskirts of Newport, just off the M4. For details visit here.